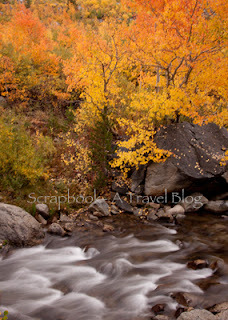 Fall color is one of the wonderful things I have seen in California- Eastern Sierras. 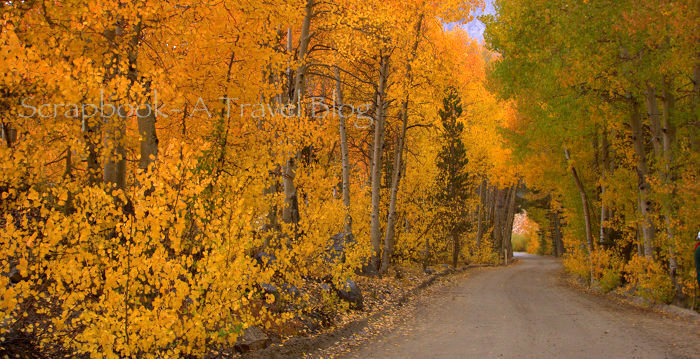 One weekend I thought of driving up to the Mono County and check out what I see in the pictures of fall colors is really a truth. And I found out it was amazing, just like in the pictures! I really didn't have a fixed plan on where I was heading to, I just drove to Yosemite National Park and took the Tioga road towards Mono Lake. It was raining very heavily but there was no option to stop at Tioga road and so I went on. Poor visibility made it more difficult to drive on that steep graded road. Wherever I went it was raining and everything was covered with fog. I thought of stopping the madness of driving in the rain, took a room in Mammoth Lakes. Spent all the evening watching TV sipping a mugful of hot chocolate. I was hoping the next morning would be gorgeous. And it was! There was continuous drizzle but everything looked so clean and colorful! I drove all around June Lake Loop. There were cabins in the midst of that fiery colorful aspen fields! Some day I would spend a week there, I thought. I stopped at every spot I could and took pictures. But, still there wasn't that Aha moment for me. One of the photographers suggested me to head to Bishop area for Lake Sabrina and two nearby lakes in the higher altitude. I thought of checking them out! And there it was- A heaven. Painted with pale green, bright yellow, light orange and intense gold. The roads to the lakes were lined up with colorful trees on either side. 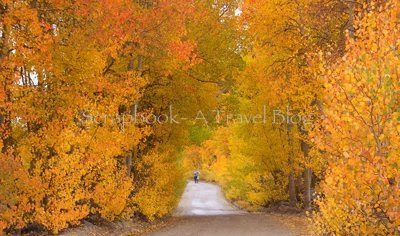 Walking on the trails covered with golden leaves of aspen was a great experience. At times it felt- it wasn't real :) I took few pictures and then didn't bother much about photography. I wanted to enjoy the bigger picture than looking through the viewfinder. I walked up till end of the roads, then I went on the trails to the lakes. I wanted to stay there forever watching those clouds covering up the mountain tops, the colorful trees which painted the mountain slopes. But, the rain approached like an announcement and it was time for me to leave. I remembered a quote by Lisa St Aubin de Teran- Traveling is like flirting with life. It's like saying, I would stay and love you, but I have to go, this is my station. How true? A word of caution would be to drive carefully in the storm on some of the narrow roads leading to the high altitude lakes and viewpoints. Also there are many steep grades which heat up the engine of your vehicle. Give it some rest and cool it. There are many websites and blogs dedicated to provide information on fall color status. Check before heading out for the peak time and also the weather forecast. It is definitely a heaven! I agree with you Kusum, it was definitely heaven. And that stream shot, i truly love so much, as i particularly like flowing waters and waterfalls. I will tell you something, autumn for me is still a dream, which i might not experience in this lifetime. I am hoping for a miracle so i can see at least once! Thank you Andrea. Glad you enjoyed the post on fall colors. I wonder why is Autumn dream for you? Live in a region which has only three seasons like we have in India? Well, I definitely hope you will see it once! Oh, heavenly indeed!! What perfect captures of the beauty of autumn!! And the stream is indeed beautiful! 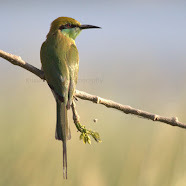 I always love your captures, Kusum, you seem to find pleasure in the same beauties of nature that I do!! Thank you for sharing and what a lovely way to end my day!! Have a wonderful week!! beautiful. hey, some of the national parks (grand canyon) are opening on the state's dime. your vacay is not all wasted. I am already in Utah :) Not sure I can do everything I thought, but something is better than nothing! Thanks. Beautiful color you found! We took that drive across the top of Yosemite in June about 20 years ago, it is beautiful. Wow wow wow! The colours and photos are stunning! Wow, what stunning photos and what gorgeous colors! Definitely heaven on earth. Well said Bhatiaji, scattered gold! I have never seen fall colors like that except in photos. How wonderful to be surrounded by the trees and breathe the air they do. Yes it was nice! The air was fresh too Jenny! I hope you will get to see the colors some day soon! Fabulous colours.......thanks for sharing the beauty. Whatever little I have traveled in Europe is during early spring, I hope to travel in autumn some time. Yes, every season has its charm, even winter! Gorgeous golden hues! And such lovely captures. 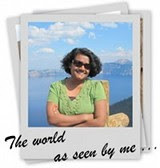 It sure is a heaven Kusum! The golden and orange hues in your pictures are simply beautiful! I wish to drive in US and Canada someday during Autumn! Thanks Michelle! Change of seasons and it is unbearably cold!